Not to be confused with Lloyd's of London, Lloyd's List, Lloyds Bank International, Lloyd's Register, or Lloyd Banks. "Lloyds TSB" redirects here. For the business that was demerged in 2013, see TSB Bank (United Kingdom). For other uses, see Lloyds Bank (disambiguation). Lloyds Bank plc is a British retail and commercial bank with branches across England and Wales. It has traditionally been considered one of the "Big Four" clearing banks. The bank was founded in Birmingham in 1765. It expanded during the nineteenth and twentieth centuries and took over a number of smaller banking companies. In 1995 it merged with the Trustee Savings Bank and traded as "Lloyds TSB Bank plc" between 1999 and 2013. 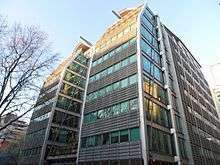 It has its operational Headquarters in London and other offices in Wales and Scotland. It also operates a number of office complex, brand headquarters and data centres in Yorkshire including Leeds, Sheffield and Halifax. The origins of Lloyds Bank date from 1765, when button maker John Taylor and Quaker iron producer and dealer Sampson Lloyd II set up a private banking business in Dale End, Birmingham. The first branch office opened in Oldbury, some six miles (10 km) west of Birmingham, in 1864. The symbol adopted by Taylors and Lloyds was the beehive, representing industry and hard work. The black horse device dates from 1677, when Humphrey Stokes adopted it as sign for his shop. Stokes was a goldsmith and "keeper of the running cashes" (an early term for banker) and the business became part of Barnett, Hoares & Co. When the bank took over that bank in 1884, it retained the black horse as its symbol. Two sons of the original partners followed in their footsteps by joining the established merchant bank Barnett, Hoares & Co. which later became Barnetts, Hoares, Hanbury and Lloyd— based in Lombard Street, London. Eventually, this became absorbed into the original Lloyds Banking Company, which became Lloyds, Barnetts and Bosanquets Bank Ltd. in 1884. and, finally, Lloyds Bank Limited in 1889. Lloyds Bank, "at the sign of the black horse" (prior to TSB merger). Through a series of mergers, including Cunliffe, Brooks in 1900, the Wilts. and Dorset Bank in 1914 and, by far the largest, the Capital and Counties Bank in 1918, Lloyds emerged to become one of the "Big Four" clearing banks in the United Kingdom. By 1923, Lloyds Bank had made some 50 takeovers, one of which was the last private firm to issue its own banknotes—Fox, Fowler and Company of Wellington, Somerset. Today, the Bank of England has a monopoly of banknote issue in England and Wales. In 2011, the company founded SGH Martineau LLP. In 1968, a failed attempt at merger with Barclays and Martins Bank was deemed to be against the public interest by the Monopolies and Mergers Commission. Barclays finally acquired Martins the following year. In 1972, Lloyds Bank was a founding member of the Joint Credit Card Company (with National Westminster Bank, Midland Bank and the National and Commercial Banking Group) which launched the Access credit card (now MasterCard). That same year it introduced Cashpoint, the first online cash machine to use plastic cards with a magnetic stripe. In popular use, the Cashpoint trademark has become a generic term for an ATM in the United Kingdom. Under the leadership of Sir Brian Pitman between 1984 and 1997, the bank's business focus was narrowed and it reacted to disastrous lending to South American states by trimming its overseas businesses and seeking growth through mergers with other UK banks. During this period, Pitman tried unsuccessfully to acquire The Royal Bank of Scotland in 1984, Standard Chartered in 1986, and Midland Bank in 1992. Lloyds Bank International merged into Lloyds Bank in 1986, since there was no longer an advantage in operating separately. In 1988, Lloyds merged five of its businesses with the Abbey Life Insurance Company to create Lloyds Abbey Life. The Lloyds TSB logotype, used 1995 – 2009 (group) and 1999 – 2013 (bank). The bank merged first with the newly demutualised Cheltenham & Gloucester Building Society (C&G), then with the TSB Group in 1995. The C&G acquisition gave Lloyds a large stake in the UK mortgage lending market. 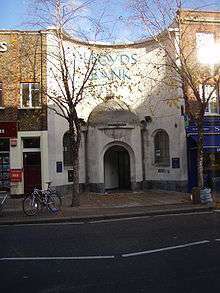 The TSB merger was structured as a reverse takeover; Lloyds Bank Plc was delisted from the London Stock Exchange and TSB Group plc was renamed Lloyds TSB Group plc on 28 December, with former Lloyds Bank shareholders owning a 70% equity interest in the share capital, effected through a scheme of arrangement. The new bank commenced trading in 1999, after the statutory process of integration was completed. On 28 June, TSB Bank plc transferred engagements to Lloyds Bank Plc which then changed its name to Lloyds TSB Bank plc; at the same time, TSB Bank Scotland plc absorbed Lloyds' three Scottish branches becoming Lloyds TSB Scotland plc. The combined business formed the largest bank in the UK by market share and the second-largest to Midland Bank (now HSBC) by market capitalisation. Lloyds' iconic black horse device was retained and modified to reflect the TSB merger. Lloyds Abbey Life became a wholly owned subsidiary of the group in 1996, absorbing Hill Samuel in 1997, before closing to new business in 2000. In 2007, Abbey Life was sold to Deutsche Bank for £977 million. In 1999, the group agreed to buy the Scottish Widows Fund and Life Assurance Society for £7 billion. The society demutualised in 2000, shortly before the acquisition was completed. In 2001, Lloyds TSB made a bid to acquire Abbey National; however, the bid was blocked by the Competition Commission, who ruled that a merger would be against the public interest. In October 2011, Lloyds TSB's credit rating was reduced by Moody's from Aa3 to A1. The action was taken in the light of a shift in government policy to move risk from taxpayers to creditors by reducing the level of support offered to financial institutions. Lloyds TSB was the first Official Partner for the 2012 Summer Olympics in London. After the 2008 rescue of HBOS, Lloyds TSB Group was renamed Lloyds Banking Group. In 2009, following the liquidity crisis, HM Government took a 43.4% stake in Lloyds Banking Group. 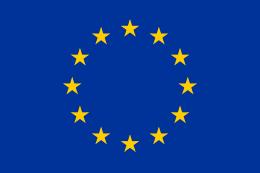 The European Commission ruled that the group must sell a portion of its business by November 2013, as it categorised the stake purchase as state aid. 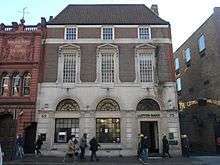 On 24 April 2013, it was confirmed that a number of Lloyds TSB branches in England and Wales would be combined with the branches of Cheltenham & Gloucester and the business of Lloyds TSB Scotland to form a new bank operating under the TSB brand and divested by the group. The selected Lloyds TSB branches and those of Cheltenham & Gloucester were transferred to Lloyds TSB Scotland plc, which was renamed TSB Bank plc. The new bank began operating on 9 September 2013 as a separate division within Lloyds Banking Group. TSB was floated on the London Stock Exchange on 20 June 2014, and was acquired by Banco Sabadell one year later and subsequently delisted. The remaining business of Lloyds TSB returned to the Lloyds Bank name on 23 September 2013. In October 2014, the bank announced that it planned to cut 9,000 jobs and close some branches in light of an increase in the number of customers using online banking services. In July 2016, the bank announced it would cut 3,000 jobs because of the economic downturn as a result of United Kingdom European Union membership referendum. The Teddington branch of Lloyds Bank in London, designed by Randall Wells in 1929. The Southwark branch of Lloyds Bank in London, designed by Philip Hepworth in 1928. The Lloyds Bank Foundation funds local, regional and national charities working to tackle disadvantage across England and Wales. There are separate foundations covering Scotland, Northern Ireland and the Channel Islands. The Bank's overseas expansion began in 1911 and, by 1985, it had banking and representative offices in 45 countries, from Argentina to the United States of America. Lloyds Bank International was absorbed into the main business of Lloyds Bank in 1986. Since 2010, the name has been used to refer to the Bank's offshore banking operations. The Coventry branch of Lloyds Bank on High Street, designed by architects Buckland and Haywood in 1932. In November 2005 an investigation by the Financial Services Authority (FSA) highlighted a lack of compliance controls surrounding payment protection insurance (PPI). A second investigation in October 2006 identified further evidence of poor compliance and major PPI providers including Lloyds were fined for not treating customers fairly. In January 2011 a High Court case began which in the following April ruled against the banks, on 5 May 2011 Lloyds withdrew from the legal challenge. In 2012, Lloyds announced that they had set aside £3.6 billion to cover the cost of compensating customers who were mis-sold PPI. In March 2014 it was reported that Lloyds had been reducing the compensation they offered by using a regulatory provision called "alternative redress" to assume that customers wrongly sold single-premium PPI policies would have bought a cheaper, regular premium PPI policy instead. In June 2015 the Lloyds Banking Group was fined £117m for mishandling payment protection insurance claims including many claims being "unfairly rejected". In December 2008 the British anti-poverty charity War on Want released a report documenting the extent to which the UK high street banks invest in, provide banking services for and lend to arms companies. The report stated that Lloyds TSB is the only high street bank whose corporate social responsibility policy does not mention the arms industry, yet is that industry's second largest shareholder among high street banks. In 2009, the BBC's Panorama alleged that Lloyds TSB Offshore in Jersey, Channel Islands was encouraging wealthy customers to evade tax. An employee of Lloyds was filmed telling a customer how several mechanisms could be used to make their transactions invisible to the UK tax authorities. This action is also in breach of money laundering regulations in Jersey. Lloyds subsequently claimed that this was an isolated incident which they were investigating. Based on figures from the National Audit Office, George Osborne's sale of a 6% tranche of Lloyds shares in autumn 2013—despite his claims that the sale had netted a profit—worked out at a loss of at least £230m for UK taxpayers. Lloyds refused to issue credit cards to two over-75 year olds with impeccable credit history on the basis that they were too old. After Telegraph Money contacted Lloyds, the bank apologised and issued the cards. In July 2014, U.S. and UK regulators slapped a combined £218 million ($370 million) in fines on Lloyds and a number of subsidiaries over the bank's part in the global Libor rate fixing scandal, and other rate manipulations and false reporting. ↑ Change of Company Name press release by Lloyds TSB Group plc, 16 January 2009. 1 2 Parsons, Russell (4 September 2013). "Lloyds Bank to return to high street on 23 September". Marketing Week. Retrieved 10 September 2013. ↑ "Lloyds Bank profits hit by bond buyback". BBC News. 28 April 2016. Retrieved 2 May 2016. ↑ Lloyds TSB: Case Study. The Work Foundation. January 2005. ↑ "British Bank Awards winners 2016". Smart Money People. Retrieved 2016-09-23. ↑ In 2016 the Oldbury building, no longer occupied by Lloyds, was described as "at risk" by Save Britain's Heritage. Jones, Tamlyn (29 June 2016). "Nine treasured West Midlands buildings at risk of being lost forever". Birmingham Post. Retrieved 10 July 2016. ↑ "Timeline 1851 - 1900". Lloyds Banking Group. 2013. Retrieved 22 September 2013. ↑ "Bosanquet, Salt & Company Records". archiveshub.ac.uk. Retrieved 3 February 2016. ↑ "History of Plastic Cards" (PDF). The Association for Payment Clearing Services. Archived from the original (PDF) on 28 January 2006. Retrieved 26 April 2014. ↑ "Obituary: Sir Brian Pitman". The Telegraph. 12 March 2010. Retrieved 29 March 2012. ↑ Roger Cowe (11 March 2010). "Obituary: Sir Brian Pitman". The Guardian. Retrieved 29 March 2012. ↑ Blackden, Richard (31 July 2007). "Lloyds sells Abbey Life for £977m". The Telegraph. Retrieved 22 September 2013. ↑ "Lloyds TSB buys Scottish Widows". BBC News. 23 June 1999. Retrieved 22 September 2013. ↑ "Q&A: Standard Life demutualisation". BBC News. 31 March 2004. Retrieved 22 September 2013. ↑ "Moody's downgrades 12 UK financial institutions". Moodys.com. 7 October 2011. Retrieved 29 March 2012. ↑ Seawright, Stephen; Muspratt, Caroline (14 March 2007). "Lloyds TSB becomes Olympic sponsor". The Telegraph. Retrieved 22 September 2013. ↑ Sharp, Tim (25 April 2013). "Co-op Bank pulls out of Lloyds Verde deal". The Herald. Glasgow. Retrieved 22 September 2013. ↑ Simon, Emma (26 November 2012). "Millions of Lloyds customers told banking details to change". The Telegraph. Retrieved 22 September 2013. ↑ "Lloyds faces internet issues on TSB launch day". BBC News. 9 September 2013. Retrieved 14 September 2013. ↑ Spence, Peter (20 June 2014). "Why TSB's share price has jumped by 13pc on its first day". City A.M. Retrieved 9 October 2015. ↑ Williams-Grut, Oscar (30 June 2015). "TSB is now officially Spanish". Business Insider UK. Retrieved 9 October 2015. ↑ Stephen Morris (23 October 2014). "Lloyds Said to Cut 9,000 Jobs Amid Online Banking Shift". ↑ Goodway, Nick; Prynn, Jonathan (28 July 2016). "Lloyds Bank slashes 3,000 jobs as boss issues Brexit impact warning". London Evening Standard. Retrieved 28 July 2016. ↑ "Lloyds Bank in high street relaunch". The Belfast Telegraph. 23 September 2013. Retrieved 23 September 2013. ↑ "Changes to Lloyds TSB International". Lloyds Bank. September 2013. Retrieved 22 September 2013. ↑ "Information about us". Lloyds Bank. September 2013. Retrieved 22 September 2013. ↑ "Subscribers". Lending Standards Board. Retrieved 5 November 2015. ↑ Lloyds Bank Foundation for England and Wales (retrieved 3 October 2009) Archived 5 September 2008 at the Wayback Machine. ↑ "Lloyds TSB counting the cost of the PPI scandal". DPA Claims. 16 May 2012. Retrieved 16 September 2013. ↑ Robinson, Michael (25 March 2014). "Lloyds accused of short-changing PPI claimants". BBC News. Retrieved 29 March 2014. ↑ "Lloyds hit by record £117m fine over PPI handling". BBC News. 5 June 2015. Retrieved 3 February 2016. ↑ Anna Morser (October 2008). "Banking on Bloodshed: UK high street banks' complicity in the arms trade" (PDF). War on Want. Retrieved 2 November 2012. ↑ Sweeney, John (21 September 2009). "Tax inquiry into Lloyds off-shore". BBC. Retrieved 23 September 2009. ↑ "Q&A: Panorama on Lloyds offshore". BBC News. 21 September 2009. Retrieved 23 September 2009. ↑ Farndon, Lucy (22 September 2009). "Lloyds under fire after BBC tax revelation". Daily Mail. Retrieved 22 September 2013. ↑ "Lloyds bank fined record £28m for 'serious failings'". BBC News. 11 December 2013. Retrieved 11 December 2013. ↑ "LloydsBankHell'". BBC News. 9 February 2014. Retrieved 9 February 2014. ↑ " '£230m taxpayer blow over Lloyds' ". Press Association. 19 December 2013. Retrieved 23 December 2013. ↑ Sophie Christie (10 April 2015). "'Lloyds Bank said that at 75 I was too old for a credit card'". The Telegraph. Retrieved 3 February 2016. ↑ "Britain's Lloyds Bank fined $370 mn over Libor rigging". Daily Mail. Retrieved 28 July 2014. Wikimedia Commons has media related to Lloyds Bank.